Palm Infocenter is reporting that according to a SprintUsers forum thread, Palm is about to release two new Centro colors on Sprint. 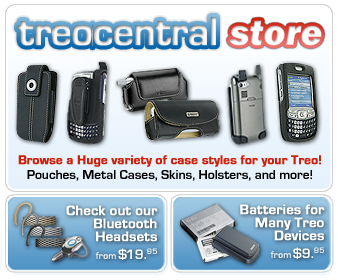 Looks like our own TreoCentral forum member heberman had spotted that thread and posted about it on Monday. The two new colors are said to be "Rose" and "Green". There aren't any photos yet of these new Centro colors. I can't imagine what the "Rose" would look like because to me, the "Pink" Centro on Sprint has a Rose color; like a "dusty rose". And I sure can't think of what a "Green" Centro would look like unless it's going to be the wild green like the keys on the AT&T White Centro. I can't wait to see these new colors. If the new colors are nice, Palm will most likely sell a lot more Centros, and be closer to adding another million units being sold. Palm has already sold 2 million Centros. According to Palm Infocenter, a reported release date of October 19th is given with no additional details if these colors will be in-store or web-only. I gotta say that I'm still in love with my "Electric Blue" Centro!